Here is my timeline of the past, present and future of the Web. Feel free to put this meme on your own site, but please link back to the master image at this site (the URL that the thumbnail below points to) because I’ll be updating the image from time to time. This makes sense to me. Web 2.0 was really about upgrading the “front-end” and user-experience of the Web. Much of the innovation taking place today is about starting to upgrade the “backend” of the Web and I think that will be the focus of Web 3.0 (the front-end will probably not be that different from Web 2.0, but the underlying technologies will advance significantly enabling new capabilities and features). See also: This article I wrote redefining what the term “Web 3.0” means. Please note: This is a work in progress and is not perfect yet. I’ve been tweaking thepositions to get the technologies and dates right. Part of thechallenge is fitting the text into the available spaces. If anyone outthere has suggestions regarding where I’ve placed things on thetimeline, or if I’ve left anything out that should be there, please letme know in the comments on this post and I’ll try to read just and update the image from time to time. If you would like to produce abetter version of this image, please do so and send it to me forinclusion here, with the same Creative Commons license, ideally. 31 Responses to How the WebOS Evolves? The next and final (post Google/Powerset) achievement in breakthrough WebOS user experience will be Jarg Corporation’s Semantic Knowledge Indexing Platform (SKIP) launch mastering “NOP” Natural Object Parsing that co-populates “well-understood native object content fragments” in the same master index with NLP-graph fragments. This final step – using conversational style requests (over a cell phone or keyboard) will provide total information awareness associated with the “roll” of the user – as derived on the fly from the full context of the request’s information needs. Only relevant knowledge will be considered and the more contexts in the request – the more highly personalized will be the returns-ranking. These returns will be a “collage,” ranked by fit-to-context, of image segments, fragrances, text, structure segments, music segments and all forms of knowledge with precise contextual relation to your on the fly the needs – fit to your “user’s roll” of the moment. Jarg will be seeking its very fist institutional capital starting in March 2007. Jarg has incorporated Semantx Life Science, Inc. Care Commons, Inc and Preemptive Alert Corporation to become best of breed in their verticals. Don’t know if you’re marking the beginnings of technology or the popularity, but wikis got started in the 1990s. Also, Napster started in 1999, so, maybe “Social Media Sharing” should come down a wee bit. One missing chunk, though, seems to be the online, pre-web social mechanisms like BBSs, forums, etc. If you’re going to list wikis and blogs (which are social apects of HTML, essentially), shouldn’t you be listing BBSs and other early USENET/IRC implemented social systems? Also… what about mobile (both voice, data, texting) and gaming (MMOs/VWs)? Don’t know if those aspects are appropriate on your graph, but it might be interesting to see them on the continuum. Again… nice work. Intriguing to see it on one line. when do i get to interact with the web the same way i do with my os? i wish i had that functionality– everything is just kind of there and its easy to use. Justamente la linea del tiempo del pasado, presente y futuro de la Web, como se han ido desarrollando las diferentes tecnologias, desde las del sistema y la información, hasta de la web. better version of this image, please do so and send it to me for inclusion here, with the same Creative Commons license, ideally. Which CC license is the graph under? You might want to specify in the footer and/or grab a new license-specific license button and use it instead of the generic “some rights reserved” button. 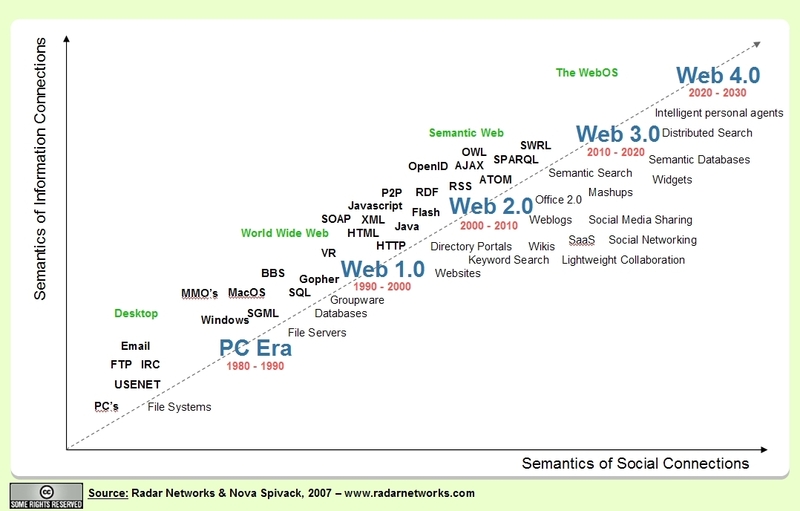 [Futurologie] : Web 2.0, en route vers le … Web 3.0, Web 4.0 et … le WebOS ! Richard Wallis of Talis recently asked some questions on his blog. Do you think Web 3.0 will be the label of the next technology wave? Will the next wave be based on Semantic Web technologies? Office furniture modern style. Mid century modern office furniture. Modern modular office furniture. Modern office furniture. i get to interact with the web the same way i do with my os? i wish i had that functionality– everything is just kind of there and its easy to use. I really don’t want to get into the product-related end of this discussion but I have to question your positioning of Windows and MacOS. I was there and I can say, categorically, that the Mac had a WIMP os long before the first versions of Windows – which were buggy then too. The point about this, really is to do with innovative style. Whatever you say about the Mac, I’ve always associated it with intuition. If you’re talking about Web 3.0 I think you’re also talking about the same thing… intuition. Companies like Apple (and Netscape) appear to have taken an intuitive and collaborative approach to the world whilst companies like Microsoft concentrated on market share. Again, this is not a partisan comment. We’re approaching the point, I suspect, where the facts of this will be clear to all. Thank you for very helpful blog. Those screencasts were very informative.